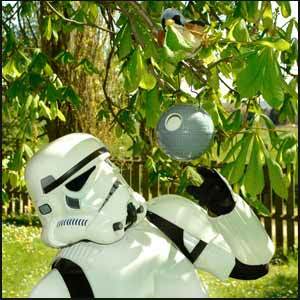 I thought I'd seen just about every Star Wars fan's must-have novelty item, but the Death Star Bird House is probably about the most useful, and certainly one that all the family can enjoy. The box contains a ceramic birdhouse (which weighs around 670g and measures 13.5cm(Ø)) and 1 wire hanger. The hanger is detachable to allow you to place it over a branch that has plenty of leaves on it so that even with the strongest gust of wind it won't be dislodged from the tree. The hanger is hard to take out once it's in place (not that difficult if your trying to unhook it, but almost impossible for it to become unhooked if it's blowing around in the wind. I was initially concerned that it would be hard to find somewhere safe for this to go. Our offices are situated on the edge of Dartmoor, and when the wind picks up you know about it, but we didn't have any problem finding somewhere suitable. It was only up for about a week before the local birds took an interest in it and we now have a feathered family living inside it. This is even more impressive when you consider that when we first put up a feeding station for the birds it took them over two weeks to spot it and start using it (and even now if we absent mindedly forget to top it up it takes them anther two weeks to start using it again when we finally get around to putting more food out). In inner city areas it also might be an idea to hide this in a tree so that you can watch the birds coming and going, but no one else can see it. These are funky, and rather rare items (It's not easy to get hold of this item in the UK, in fact the only place we've seen it so far is thefowndry.com) and the last thing you want is for it to be stolen by a jealous thief. 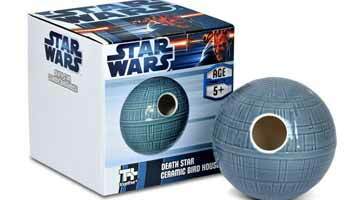 This is the ideal gift for that Star Wars fan in your life who also likes to watch the birds in their garden.